If you’ve either hired a videographer or are the in-house videographer for your business, you will inevitably need to purchase video editing and production software. Before you pull the trigger and purchase Premiere Pro, it's worth digging deeper into the product’s functionality and pricing to decide if it’s the right solution for you. How Much Does Adobe Premiere Pro Cost? 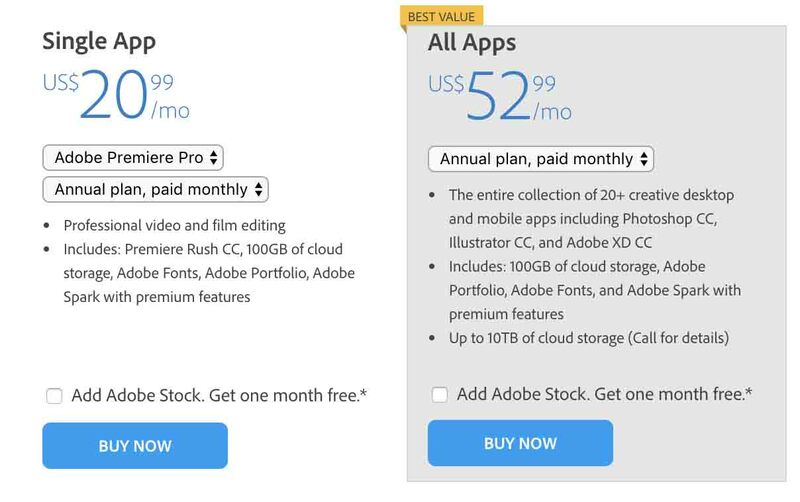 Adobe has two main ways to buy Premiere. You can either buy it alone or buy the whole suite. If you’re not looking to make motion graphics for things like lower thirds or explainer videos, you can probably get away with just investing in the single app plan. But, for very busy marketers with diverse editing skills looking to create truly top notch, interesting content, it is well worth investing in the whole suite. If you’re not well versed in the different apps, but want to be, it can also be a great educational experience with loads of tutorials and helpful people online. It might sound daunting to have to pay a monthly fee for software when there are quite a few others available for free or at a fixed, one-time price. So when should you consider spending the money every month? If you have an experienced editor or one who’s willing to learn, a monthly subscription is the right pick. If you’re looking to create professional marketing videos and export them to a wide variety of social platforms like Facebook and Twitter, Premiere Pro can help you with that. Looking to use more expensive cameras? Not all the free or cheaper editing suites can handle the footage that comes out of those things. For projects like commercials where you need high resolution footage from professional cameras, Premiere Pro is a good thing to have. With a Premiere Pro subscription, you’re also going to be able to stay on the cutting edge with regular software updates from Adobe. A lot of software can quickly go out of date, and if you aren’t privy to free updates on a regular basis, it can get pricey to stay up to date. Premiere Pro gives you updates and support for no additional charge. When Is Premiere Pro NOT Right for Your Team? If you just started a video team, and you don’t have the time to learn how to use the program, I would suggest picking a free or more simple software. Premiere Pro, while easy to learn, is quite robust, and requires a good amount of time to get comfortable with. If you only need to trim and cut clips together, Premiere Pro is not right for you. Any other suite can do that simple cutting and pasting action, so don’t waste your money. If you have a tight budget, it might not be worth it to you either. Monthly costs do add up, and while there are plenty of benefits to being in the Adobe community, it might make sense to start small and work your way up to Premiere Pro. If you’re investing in video as part of your marketing mix, the quality of editing is vital to the way your audience sees your brand. You want to make sure you have the right equipment for the job. Whether you decide to go with Premiere Pro or not, what’s most important is that you make right choice for your specific needs and goals. Don’t waste your money if you don’t need the software, but don’t miss out on some really great tools to help grow your business if you plan to make video a major part of your strategy in 2019.